entered into the national hairdressing contest. claims of contempt against him. accidentally hitting them, causing injuries. 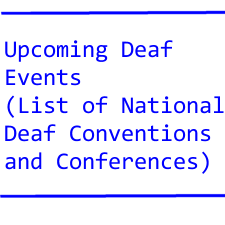 refuse to accept relay calls from the deaf! that they say. Like captions on TV â€“ for the phone! people just gesturing a lot with their hands. many other hearing people gesture a lot while speaking. Can be confusing sometimes, are they deaf or hearing! I still go to the gym to keep the doctor away! and guidance around the gym. One day at the gym, I needed to trade my outdoor shoes for gym shoes. When I was ready, I stood up to give the SSP a hint that I was ready. I looked at the front door and saw someone washing the window. It was my SSP who forgot his gym shoes! I didn’t even know he went out to get his shoes. When it is minus 20 degrees this winter, we could have a frozen SSP!